Just like you, your Detroit home has a personality, so what do you want it to say? Is your home classic, modern, maybe eclectic? Whatever personality your home exudes, Taylor Door Co. can help you build the door to best fit that personality! Create the perfect entry doors Detroit to display your home’s personality. Entry Doors Detroit by Taylor Door Co.
Taylor Door Co. is Metro Detroit’s No. 1 store for everything doors. 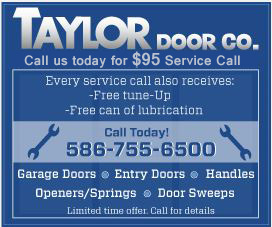 If you need a new entry doors Detroit or entry door repair, Taylor Door is there. If you call before 11 a.m. they can even do same day service! Taylor Door has more than 30 years of experience serving the Metro Detroit area. The professionals at Taylor door will help you design a custom door exactly to your liking. Entry doors Detroit range from wood, to steel, to fiberglass. You also get to choose the type of glass you want and any designs! Your entry door will literally be one of a kind. Check out Taylor Door’s collection of entry doors! Therma-Tru – Pioneer of fiberglass doors. Masonite – Beautiful and durable. A wide variety of panels and glass designs to choose from. Classic-Craft – Reproduces the look of a real wood door, with extra durability. Smooth-Star & Fiber-Classic – Extra reinforcement with solid wood lock block. Get A Taylor Door Co. Door Today! Get a quality one of a kind entry doors Detroit from Taylor Door Co. Taylor Door will help you pick the perfect design and material for your door and install it! Taylor Door even has door parts and door tutorials on how to fix your door yourself! Request a free quote for what you need done or call today at 1-800-NEW-DOOR.